New personal record by six seconds in a tactical 5000m at Texas Relays in Austin. 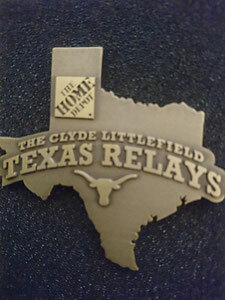 Last Thursday, I raced at the Texas Relays Distance Evening my first 5000m of the outdoor season. This event is the biggest of its kind in Texas with four days of competition, more than 7000 athletes and over 350 teams competing. As final event of the evening, the 5000m had optimal weather conditions: barely any wind and low temperatures made it perfect for us to race fast. Right from the gun, I was able to run in the planned position. I tried to run in the middle field, where I could save some energy and would still be able to react for any attacks at every time. The pacemaker started out in an even split pace, but after 2.5 laps, we were already slower than planned. My coach recommended to stay calm in a situation like that and to wait until 3000m for my move. I followed that advice but the pace did not get faster over the next laps. With six laps to go, my teammate started to wind up the pace. We went through 3000m in 8:44, which was around 8 seconds slower than planned. Since many runners are able to run a pace like that, the leading group was still pretty big and the space around me limited. I tried to make some space and started to move up in the pack, since I still felt really fresh. With 300m to go, I ran myself in 3rd position and tried to catch up to the leader. Despite a fast last half lap, I was not able to pass these two guys and finished in 3rd position in a time of 14:22.29. This time is a new personal record and also number five in UNT-history. Looking back, I am pretty satisfied with the result. I know, I am already in a good shape and in a perfect race, I would be definitely able to run a little faster. But mainly it was important to set a fast mark to give me a higher chance to be put into a faster heat in for my next 5000m, which really can affect the result. Thanks to the results of the last weeks, my coach decided that I will be able to attend on some high competitive meets in the next few weeks, which already gives me the chance to improve my personal record again.